Effective the 2006 Summer Music Conservatory, AFA no longer permits students to participate full-time in two or more programs. This is done so that students gain the full benefit of participation in their respective programs without the distraction of other priorities. However, students who wish to explore other programs or instruments may elect to sign up for private lessons in another department (e.g., an orchestra student may sign up for voice lessons or a piano student may sign up for composition lessons). 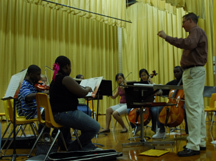 While students do not take part in the full offerings of that department, they are able to explore other music interests beyond their immediate area. Depending on the number of lessons, students can expect to pay between $90 and $150 in addition to their tuition for private lessons in another area. On rare occasions, AFA will permit students in the orchestra/chamber music program only to attend AFA on a part-time basis (students in piano, composition, choir or middle school may not attend AFA part-time). Part-time students participate in orchestra and elective classes only and attend AFA only in the mornings (e.g., from 8:45-12:00). They do not participate in chamber music or receive private lessons. By participating in orchestra, students must be available each morning during one of the ranges of dates given below so that they may rehearse and perform the selected repertory with the orchestra. Applicants unable to fulfill both the rehearsal and performance requirement will not be permitted to enroll on a part-time basis. Admissions preference will be given to orchestral applicants who are able to attend AFA for the full five-week program.